Not much to say; https://www.nexusmods.com/morrowind/mods/45286 is gone from the nexus, and I couldn't find any relevant info neither here nor in openMW's wiki's mod list. Anybody has any idea of what happened? I personally have never even heard of this OpenMW-OP mod before, and yet I read anything OpenMW related almost daily. When did you find this mod? Now it has new webpage. Last edited by johnelros on 31 Jan 2018, 04:56, edited 2 times in total. The guy is trying to make money off the backs of others, I seriously he got permission from the mod's authors, otherwise he would have listed them in a copyrights/contribution document like I did for Zini's Ultima TC. Exactly. We'll so how this goes. What I don't like is the name, because people might confuse it to be linked with the OpenMW project somehow. I guess it's nothing illegal about it since open source and all, but it's still kind of unethical if you ask me. What is this, really now? A modpack? He seriously wants money for a modpack? 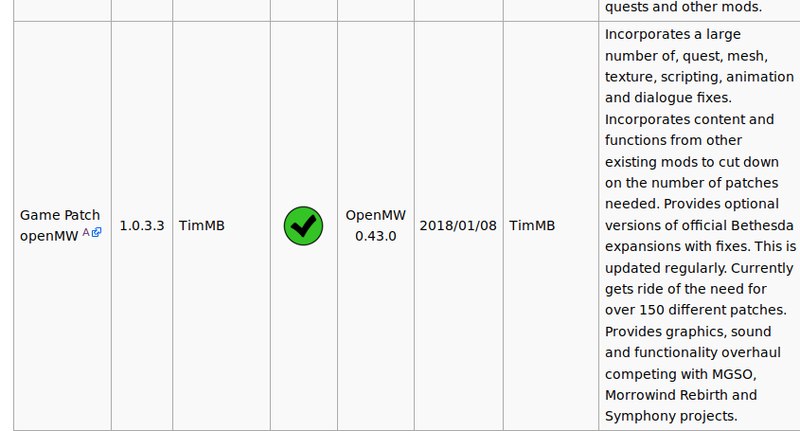 It looks like the author of this project is forum user TimMB (he was also the one who added it to the OpenMW Wiki). So it looks like he is able to respond to these threads directly. I went ahead and downloaded the project to see what it was. It's 2.3 GB of mods, all in .omwaddon format. It includes the official Bethesda mods and over 200 other mods. The readmes for all the mods are included in a folder. It also includes the original Morrowind music, but no other game assets that I could find. In this project I am correcting: meshes, textures, broken quests, misconfigured scripts, incorporating derived community modding works directly into the patch to reduce the number of patches needed and selectivly improving graphics. Not a bad goal, but I couldn't find any indication that he had gotten the permission of the original mod authors, much less any agreement to make money through their work. The author also has a GoFundMe, Patreon, and PayPal connected via NexusMods, which I won't link to so as not to encourage search engine traffic. The Kickstarter is the latest of these fundraising methods. I have no idea what the legalities are regarding making money with mods, but I suspect that making money through a modpack of others' mods isn't okay.